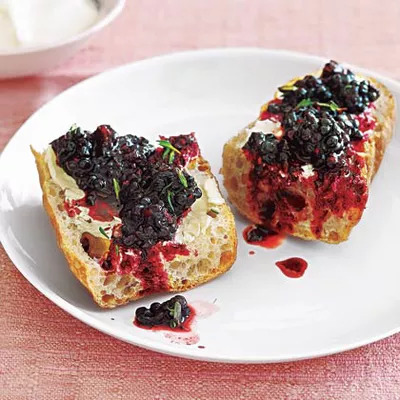 For a simple, no-cook breakfast that's also good for you, try this Tartine with Blackberry Thyme Salad recipe. It only takes five minutes to whip up this power snack , which will help you burn fat and maintain a balanced diet. For a simple, no-cook breakfast that's also good for you, try this Tartine with Blackberry Thyme Salad recipe. Load up your plate with this fruit, since it's a superfood that's high in antioxidants, vitamin C and fiber. If you can't find fresh blackberries, no worries! You can use frozen berries or other superfruits like blueberries or raspberries.